HBO’s Game of Thrones will return for its final season on Sunday, April 14th (tonight) in the US, and what better way to get hyped than with a visual effects breakdown video from an expert at Pixomondo. Yes, Dany and Tyrion’s boat, which is surrounded by ships, waves, and dragons in one episode, was all shot in front of a green-screen. You can’t that Kit Harington was actually petting a blue rock rather than an actual breathing dragon. Read more for the video and a few bonuses. Epic Games has just released Unreal Engine 4.22, and it boasts a total of 174 improvements, mainly focusing on “pushing the boundaries of photorealism in real-time environments”. You’ll also find improved build times (up to 3x faster) and new features such as real-time ray tracing. The Ray Tracing feature consists of a series of ray tracing shaders and ray tracing effects to help in achieve natural-looking lighting effects in real-time. The Path Tracer features a full global illumination path for indirect lighting that creates ground truth reference renders right inside of the engine. Read more for two more tech demo videos and additional information. This is not a live-action movie, just “Rebirth,” which is Quixel’s stunning cinematic short made in Unreal Engine 4.21. It was created by three artists at the company known for its photogrammetry expertise using its Megascans 2D and 3D physically-based asset library. The team spent onbe month in icy rain and thunderstorms scanning locales in Iceland, returning with over 1,000 scans, capturing a wide range of eco-regions and natural environments to feature in the short. Read more to watch and for additional information. Artist Kisaragi Hutae wanted to pay tribute to Nintendo’s Super Mario Bros., so he decided to recreate the iconic World 1-1 level using stop-motion animation. Yes, everything is hand-drawn, including the Question Mark Blocks, Up Mushrooms, to the Goomba stop animation. Sure, there are some imperfections, such as the background flickering slightly between frames, and a blank between each page of the notebook, but that’s what makes it even more incredible. Read more to watch. Anyone who watched The Weather Channel’s coverage of Hurricane Florence may have seen reports that seem to be straight from a science fiction film, but the technology used to create those crazy graphics are not so out of this world. The Weather Channel and The Future Group, a Norwegian augmented reality company, partnered with the makers of Unreal Engine – Epic Games – to use the tech in TV broadcasts. Continue reading for another video and more information. Brazil-based 3D artist Gustavo Soares specializes in turning pop culture characters, like Chewbacca, into cartoon-inspired creations, whether they be on the more realistic side, or complete fantasy. “I love art, independent the kind of art (traditional, digital). I love art history and I’m a big fan of the masters of the Cinquecento (Rafael Sanzio, Leonardo DA Vinci),” said Gustavo. continue reading for more. Disney Research has developed the first real-time high-fidelity facial capture method to enhance a global real-time face tracker, which provides a low-resolution face mesh, with local regressors that add in medium-scale details, such as expression wrinkles. The team discovered that although wrinkles appear in different scales and at different locations on the face, they are locally very self-similar and their visual appearance is a direct consequence of their local shape. Therefore in order to train local regressors from high-resolution capture data, they proposed an automatic way to detect and align the local patches required to train the regressors and run them efficiently in real-time. Click here for the first image in today’s viral picture gallery. Continue reading for the five most popular viral videos today, including one of a true all-screen smartphone. 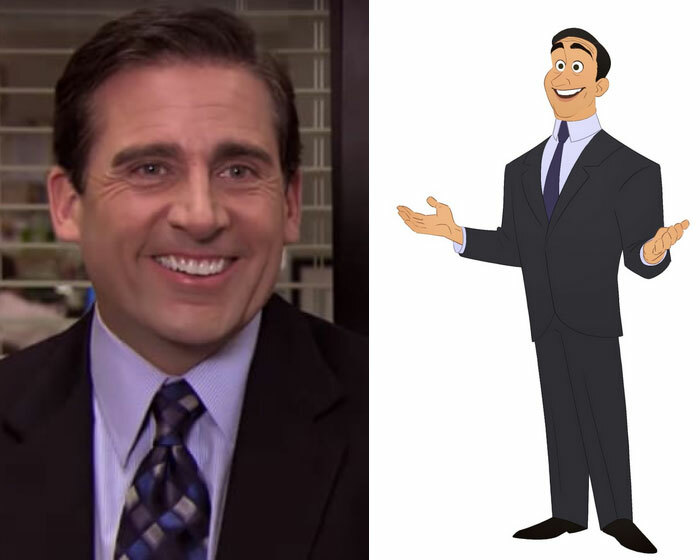 Los Angeles-based artist Marisa Livingston is a big fan of the show “The Office”, and what better way to pay tribute than by reimagining the characters in an animated series? Whether it be Michael Scott, Dwight Schrute, or Stanley Hudson, you’ll find them here. However, she isn’t the first character designer to put them in cartoons, as Cartoon Network did something similar a while back, but with the X-Men added in. Continue reading for more. Aleksandr Petrov’s Oscar-winning “The Old Man and the Sea” animated short all started in March 1997, when he and his son, Dmitri Petrov, started hand-painting each of the film’s 29,000+ frames. They used the pastel oil paintings on glass technique, which has only mastered by only a handful of animators in the world. Petrov even used his fingertips in addition to various paintbrushes to paint on the various glass sheets positioned on multiple levels, each covered with slow-drying oil paints. Continue reading for another video and more information. Self-taught digital artist Tatiana specializes in taking famous cartoon characters, such as Violet Parr from “The Incredibles”, and transforming them into realistic human versions, but with an edgy twist. “Tatiana is a 19-year-old self-taught digital artist that is better known on the internet as TatiMoons. The artist has created digital paintings since June 2016, but she was interested in drawing from a very young age,” reports BoredPanda’s Hidreley. Continue reading for more pictures.